Trundling down dun-coloured mountain slopes, they ignore hard stares and vulgarities from passing men, revelling in an activity that seemed unthinkable for previous generations of Afghan women –- riding a bicycle. The sight of a woman on a bicycle may not be unusual in most parts of the world, but it is a striking anomaly in Afghanistan where strict Islamic mores deem the sport unbecoming for women. 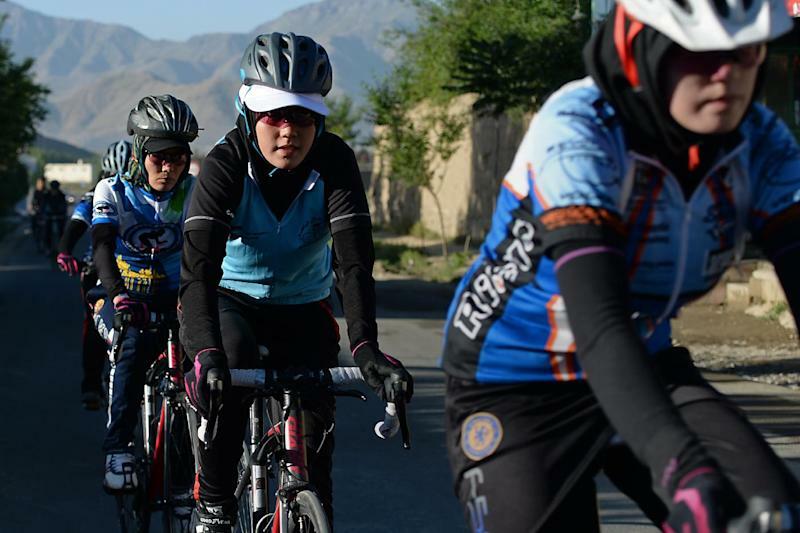 The country's 10-member national women's cycling team is challenging those gender stereotypes, often at great personal risk, training their eyes not just on the 2020 Olympics but a goal even more ambitious -- to get more Afghan women on bikes. "For us, the bicycle is a symbol of freedom," said Marjan Sidiqqi, 26, a team member who is also the assistant coach. "We are not riding bikes to make a political statement. We're riding because we want to, because we love to, because if our brothers can, so can we." One crisp morning, dressed in tracksuit bottoms, jerseys and helmets, Marjan and half a dozen team members, all aged between 17 and 21, set out for a training ride from Kabul to the hills of neighbouring Paghman. Mindful of turning heads and ogling eyes, they rode in the amber light of dawn through a landscape of grassy knolls, fruit orchards and tree-lined boulevards. A little boy dressed in a grubby shalwar kameez stopped by the wayside and stared at the girls with wonder and amazement. Up ahead, dour-looking bearded men in a Toyota minivan pulled up parallel to the cyclists -- their stares were more menacing. But the wheels continued to spin as the women powered ahead undaunted. "You're bringing dishonour to your families." But the team say they are emboldened despite such attitudes -– partly due to the encouraging support from unexpected quarters. Fully cloaked in black, the mother of one cyclist came out to cheer them on the way to Paghman, waving, applauding, and exuding enthusiasm that is not shared by most of her extended family. "My daughter is living my dream," said Maria Rasooli, mother of 20-year-old university student Firoza. "My parents never allowed me to ride a bicycle. I can't let the same happen," she said, adding that she and her husband kept relatives and neighbours in the dark about their daughter's sport because "they just won’t understand". Thirteen years since the Taliban were toppled from power in a US-led invasion, Afghan women have taken giant strides of progress with access to education and healthcare. Female lawmakers are no longer an anomaly in Afghan politics and the ongoing election saw the participation of the country's first woman vice presidential candidate. That marks a sea change in women's rights from the Taliban-era, when women weren't allowed to leave their homes without a male chaperone and were brutally repressed and consigned to the shadows. But gender parity still remains a distant dream as conservative attitudes prevail. That sentiment is portrayed in a mural by graffiti artist Shamsia Hassani on the walls of a Kabul cafe: burqa-clad women trapped in a watery universe -- an allegory of women in the post-Taliban era who have a voice but still cannot be heard. It's hard to reason with self-proclaimed arbiters of "morality" who regard a woman mounted on a bicycle as unconceivably risque, say members of the cycling team. On a recent training session outside Kabul, three young Afghan men riding a motorbike swooped out of nowhere and sideswiped one of the cyclists, 18-year-old Sadaf Nazari, who tripped and tumbled on top of Marjan. Marjan badly injured her back in the incident, which drove Mohammed Sadiq, head of the Afghan Cycling Federation who was trailing the women in his SUV, into a paroxysm of fury. He chased down the men -– the two pillion riders escaped, but he caught the driver by his collar and hauled him over to the police headquarters. Sadiq, who established the team in 2003 after his own daughter expressed an interest in cycling, said the women's safety was a constant concern -- and plans for international troops to pull out of Afghanistan by 2016 has perpetuated those anxieties. "If the Taliban return, the first casualty will be women's rights," he said in an interview in Kabul's old city. As he spoke, half a dozen young women, some sporting kohl-accented eyes and henna-dyed hair, convened in his living room for a discussion about nutrition and diet with Shannon Galpin, an American competitive cyclist who is coaching the team for the forthcoming Asian Games in South Korea. 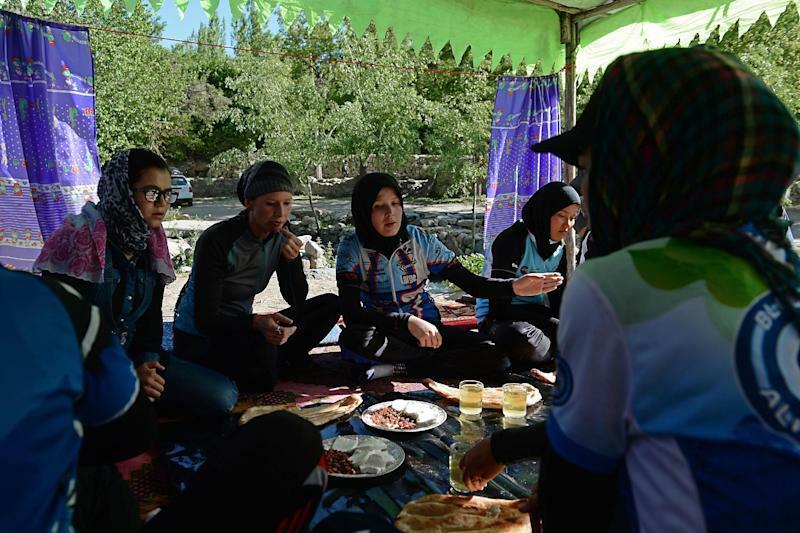 Back on the training ride, the exhausted girls gathered by a freshwater stream in Paghman to refuel on naan bread, raisins and cottage cheese. Near a roadside kiosk where fresh plums, cherries and mulberries dangled from strings, a curious Afghan man sidled up to Marjan. "Are you with those cyclists going around the mountain?" he asked. Startled, Marjan's eyes darted around as she braced for trouble. "Are they boys or girls?" the man enquired. Marjan's face lit up with bravado.